Considering kitchens are the heart of the home, casting the right light in them is essential. Easier said than done, though, right? And since it's also important to keep things clutter-free in the kitchen, that means there's less room for decorative items and larger pieces of furniture that show off style and personality. Well, the key is to transform each functional element into an opportunity to make a stylish statement. That's where pendant lights swoop into the kitchen, offering a simple solution. Pendant lights don't take up any prime square footage, and if you choose the right one for your space, it can double as a work of art that ties the whole room together. So to discover all the design tricks for choosing pendant lighting for kitchens that exudes beauty and character and, most importantly, paves the way for an efficient workstation, we tapped three of our favorite interior designers, Brett Mickan of Brett Mickan Interior Design, Chris Rak of Robson Rak, and Britt Zunino of Studio DB. As expected, their advice is illuminating. Read on for their tips and to find out their favorite pendant lighting for kitchens as well as which ones they have in their own homes. Then, shop 18 chic and practical pendant lights for a style-savvy, well-lit kitchen. "The primary function of lighting in a kitchen is task lighting," Mickan explains, and "therefore, it needs to light working areas well and be color-corrective." But since kitchens tend "to be the focus of family life and entertaining and [are also] often part of an open living space, there are so many aesthetic things to consider." As such, here's a rule of thumb to light the way: "Your lighting should direct the eye." Mickan says that he likes the "source of lighting on most work surfaces to be hidden," which you can achieve with under-cabinet lighting, in-cabinet lighting, and directional downlights," meaning lights with fittings that prevent them from casting light out from the sides. "This will light the surface without spilling into the rest of the space," he tells us. And then when it comes to making a style statement, that's where pendant lights come in, which is also the perfect time to "pick up on the color or finish accents in the interior. Perhaps brass to match the hardware or a vintage fixture to add depth to a pure white contemporary space." 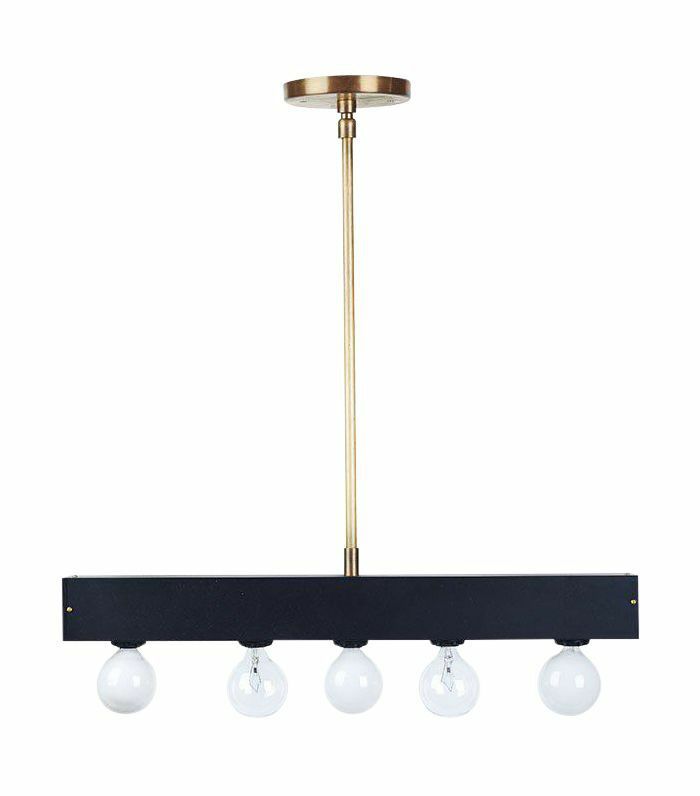 If you're looking for a seamless, extruded brass strip pendant that "hangs almost invisibly above a large island" try the Highline from Archier. And "there is nothing like a vintage fixture to add depth and a distinctive personality to a design. What better way to stamp a sense of place on a contemporary kitchen than with this stunning chandelier over the island?" As far as his own home, Mickan likes to design with a sense of history, which is always a good way to make sure everything contributes to a cohesive mood, from architectural bones to furniture and décor. Since "my home is a contemporary terrace that stands where there was once an industrial warehouse, my home gives a wink toward the industrial. In my kitchen, I had the pleasure of working with another young Australian manufacturer, Savage Design, and I have three of its Adamas pendants in a knurled solid brass that will patina beautifully hanging above my marble island." "If your kitchen has an island bench, then you'll be looking for lighting which has enough lumens to allow it to be used as a practical workstation but also be able to be dimmed down for an intimate get-together with friends," advises Chris Rak of Robson Rak. With this in mind, "choose a light which will perform as a task light but one which would also help create the ambiance needed to have people sitting around comfortably." Again, "having dimmable lights is the key" to a versatile space that can function well for a variety of occasions and audiences. Personally, "I like a long linear bar light, as it helps define and bring the space down to an intimate level but is also practical with its large beam of light. 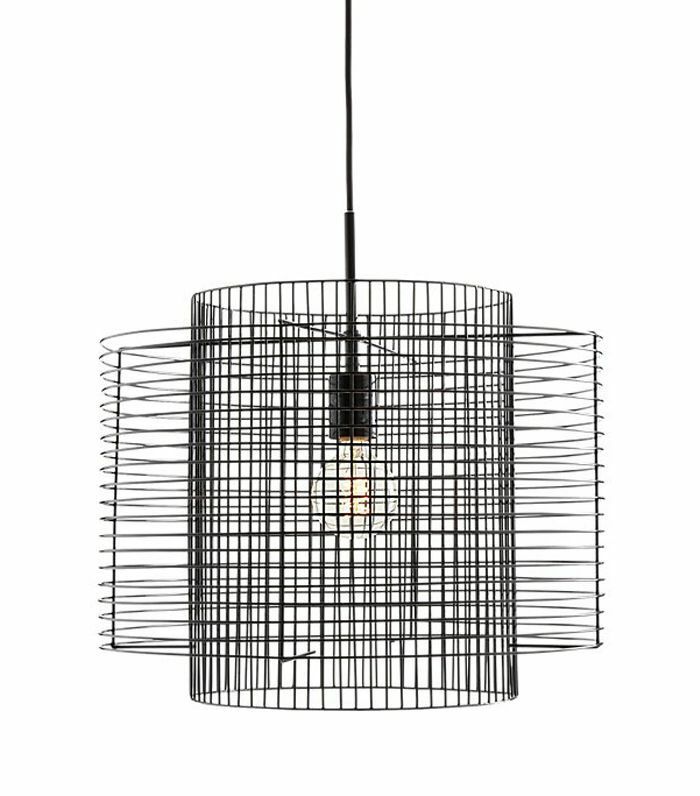 I also like a wire mesh light with its naked light bulb, as it has the transparency (so it won't take over the space) but allows itself to become a decorative object as well. In our own kitchen, we have spotlights which are on dimmers. I like to treat my island bench as a cooking workstation but will dim the lights down when I've got people over," Rak tells us. Zunino's number one tip is to incorporate a "variety of kitchen lighting" types and styles throughout your space to make sure you're checking all the boxes in terms of both form and function. "Remember, you should be lighting your cabinetry, shelves, and countertops, not the floor." Her pro trick? "We often incorporate hidden, under-cabinet LED lighting to brighten the workspace, minimal recessed lights for ambient lighting, and some type of decorative fixture, whether it's pendants, sconces, or a large fixture," she says, echoing Mickan's advice. And while "kitchens provide an excellent platform for decorative lighting, pick and chose your moments wisely." For example, "if your dining table is nearby and has a bold fixture above, choose something subtler over the island or incorporate interesting wall sconces instead. Or go big in the kitchen and put a very minimal linear light over your dining table." Also, keep in mind that "opposites attract. I'm a big fan of juxtaposing vintage lighting in modern kitchens and contemporary lighting in more traditional spaces. The tension between the different styles makes for a more interesting home," Zunino says. "At our home upstate, we have a very large island that is the gathering place for many meals and parties. 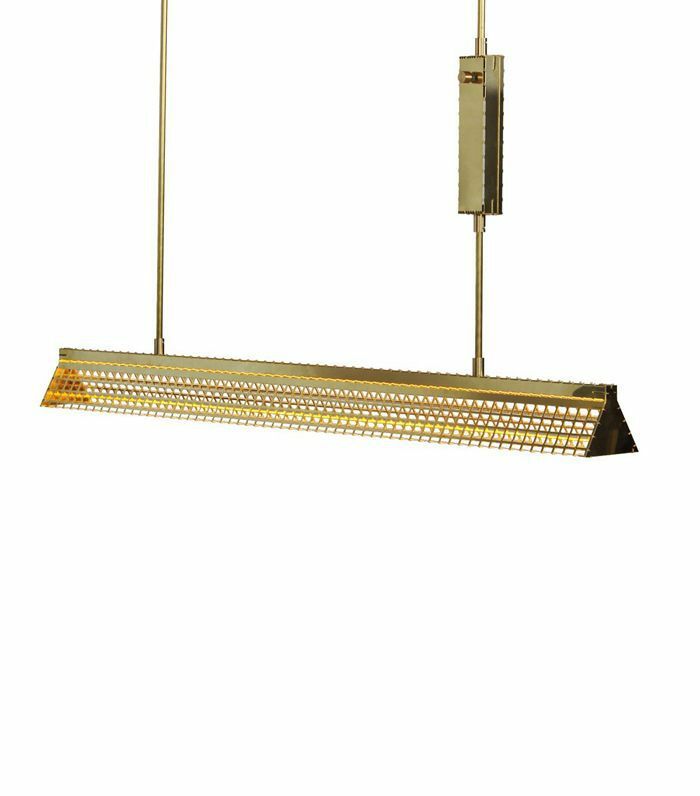 Because if its generous size, we opted for a long, linear Beaubien fixture from Lambert & Fils," speaking to the importance of consistent attention to proportion and scale. "The minimalist light is a beautiful sculpture and functional lighting all in one," which is always the balance we're looking for in the kitchen or small spaces in general. 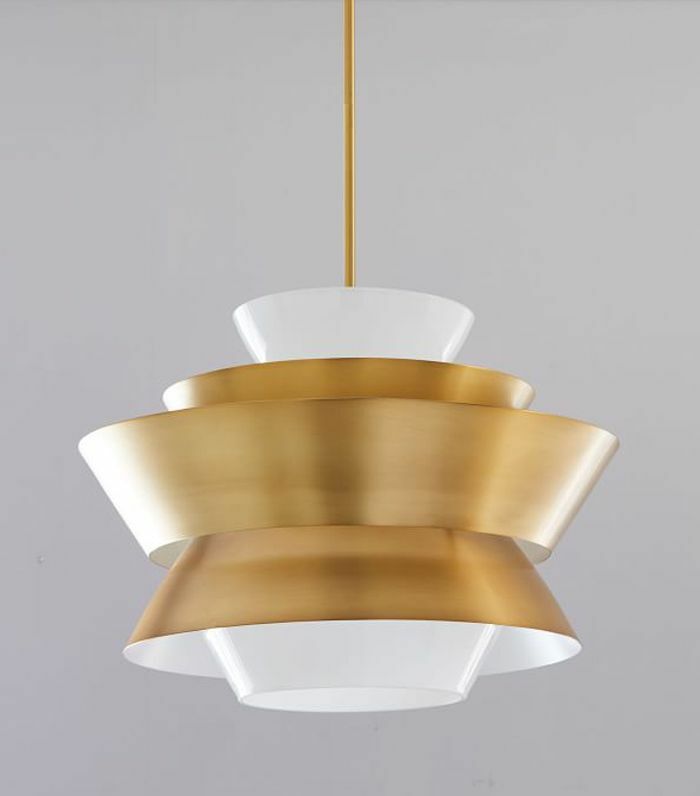 Some of her favorite pendant lights for kitchens right now are the Tricone Pendant from Allied Maker, Past and Future suspension light from Piet Hein Eek for Veronese, and the Laurent Collection from Lambert & Fils, preferably in pink or cobalt blue for a great statement over an island. Ready to start looking for pendant lighting to use in your own kitchens? Shop through our favorites below. 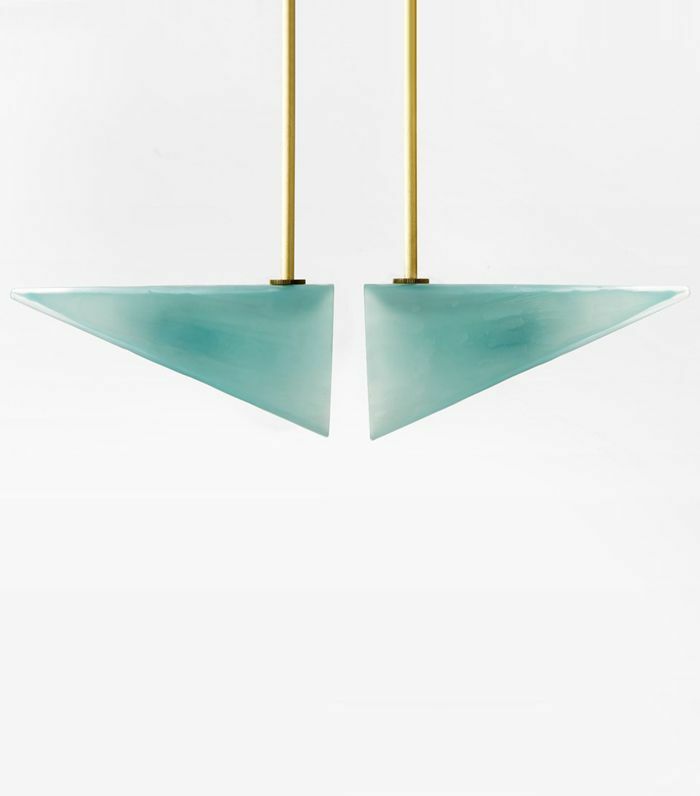 Slim in size, this geometric brassy pendant will thrive in pretty much any environment. Cluster it with a few over a long kitchen island or let it stand alone over a smaller bistro table. 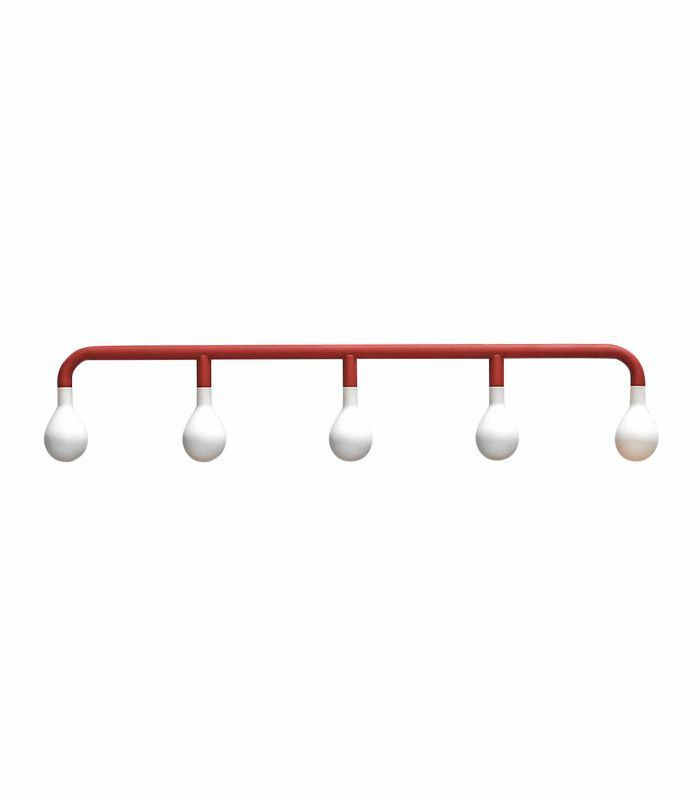 Adding a pop of red and just the right amount of quirk, this linear pendant light is the perfect piece to hang above a kitchen island. 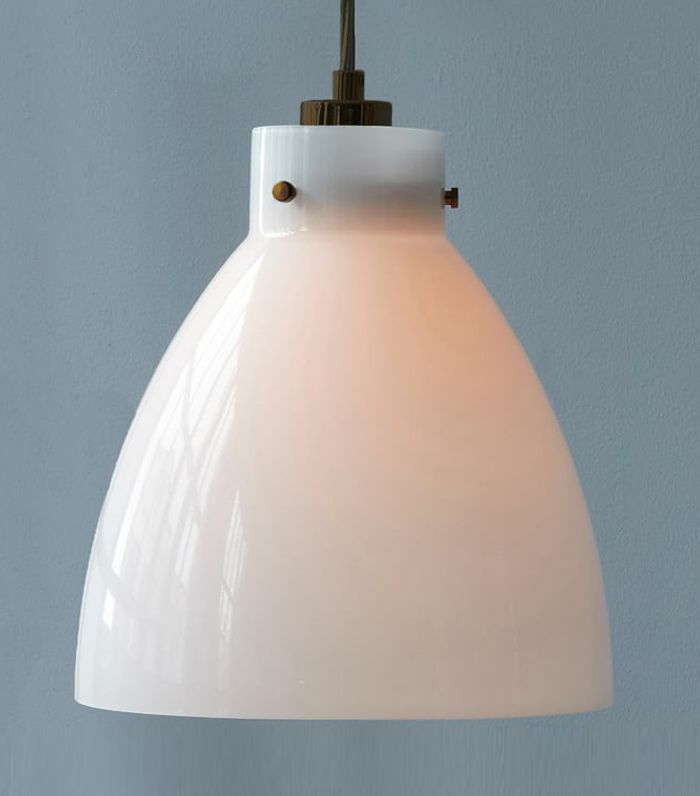 Inspired by old-fashioned milk glass, this industrial-style pendant will last throughout the years, evolving with your needs and style. 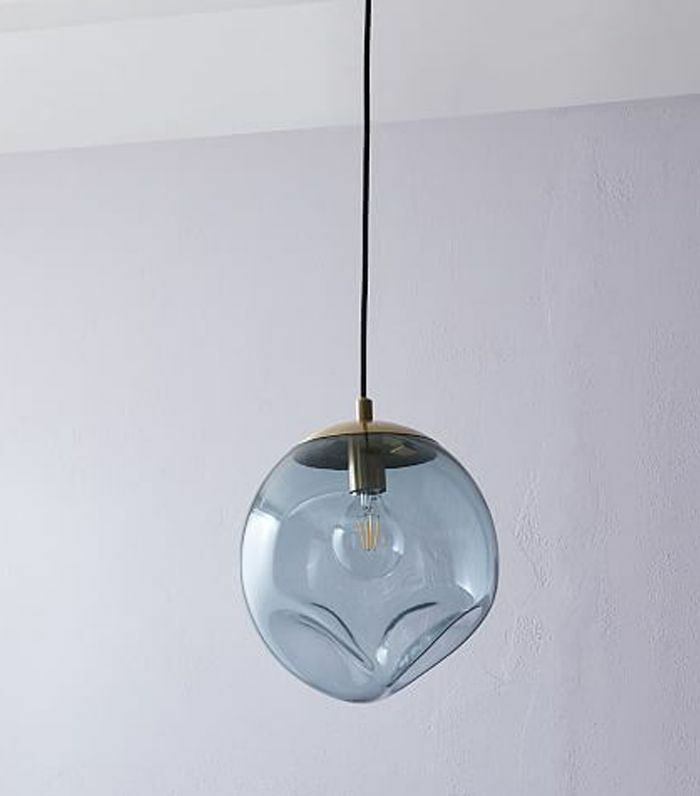 Opt for an elegant aesthetic with a bulbous ceiling pendant with smoky-grey glass. It'll elevate any kitchen, from a minimalist space to something more traditional or even eclectic. 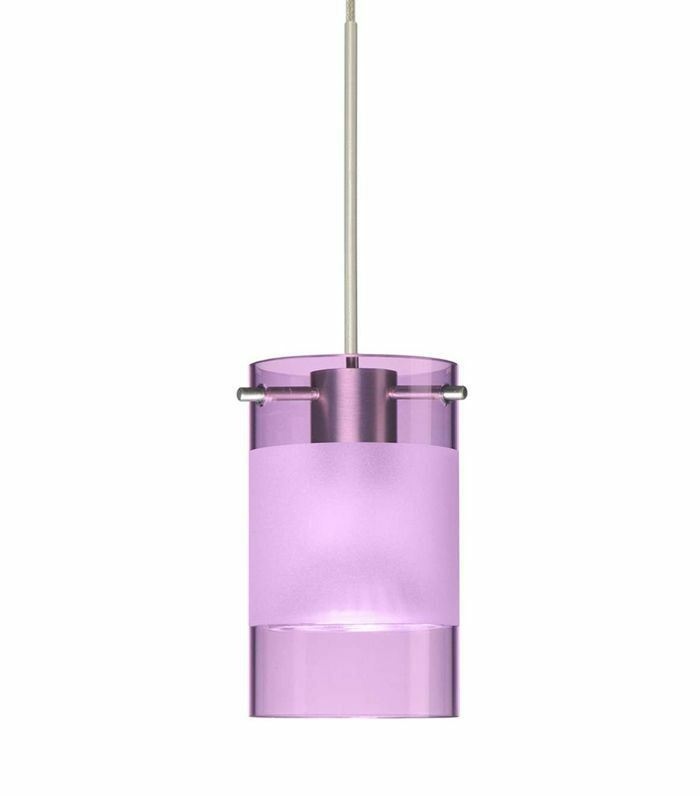 Have some fun and cash in on Pantone's color of the year with this ultraviolet pendant light. 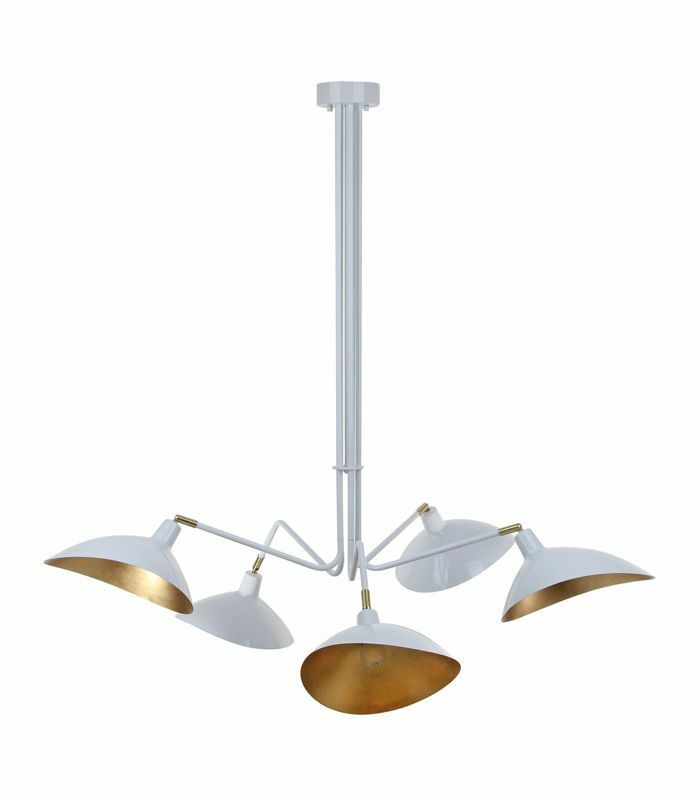 With a crisp coat of white paint and a bold metallic interior finish, this sleek five-armed pendant will introduce a touch of modern style to your space. This wire pendant light blends formal with casual, featuring clean lines, a modern geometric shape along, and a simple yet refined inky hue. If your kitchen area is looking a little lackluster, consider incorporating a subtle dash of color with this gray-blue blown-glass pendant. Let it hang as is or cluster a few together. The shape of this crisp, shiny pendant will add a unique touch to your kitchen. Opt for this light if you want to bring out other other icy elements and accents throughout your space. If you're on the hunt for a kitchen pendant that doubles as a work of art, consider your search complete. This sculptural beauty will make you and your interiors glow. 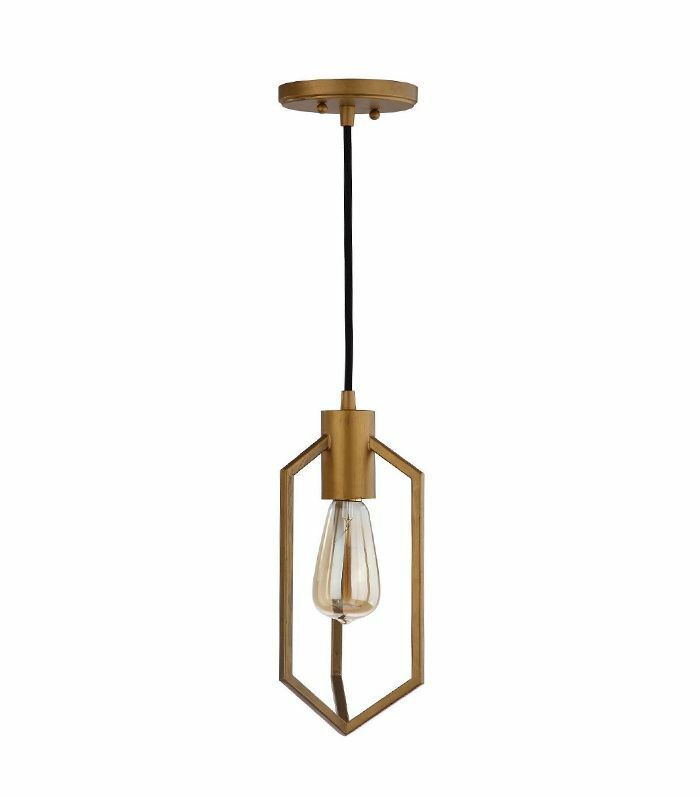 Boasting an interesting silhouette without stealing the style spotlight too much, this chic light would work well in a traditional, modern, or eclectic home. 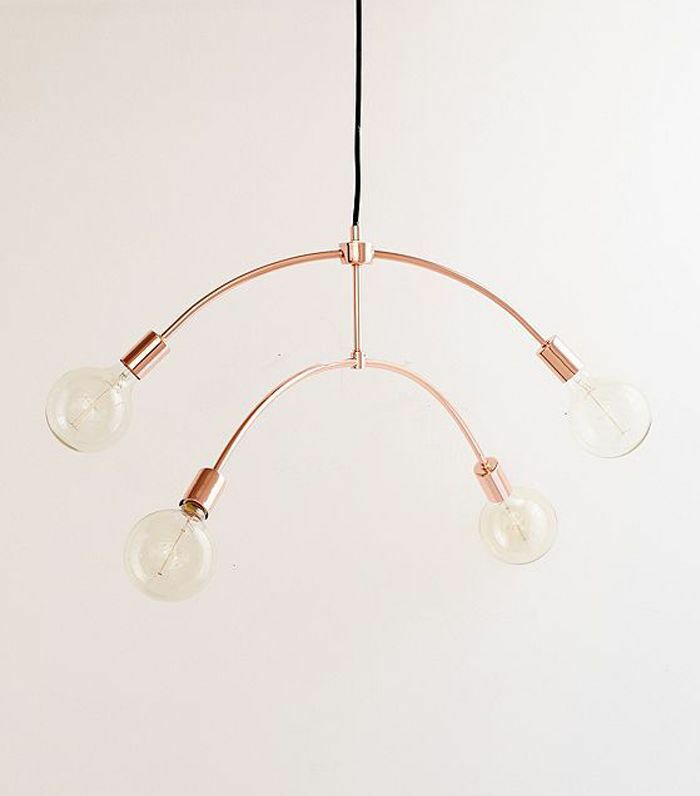 A rose-gold, mobile-inspired pendant light will earn any kitchen extra style points. Concrete is one of those materials that adds so much style and personality while still being unpretentious and understated. There are many different ways to dress this one up or down. Complete with superb proportions, sleek materials, and a hypnotizing mesh design, this artfully crafted linear pendant will illuminate your kitchen beautifully. 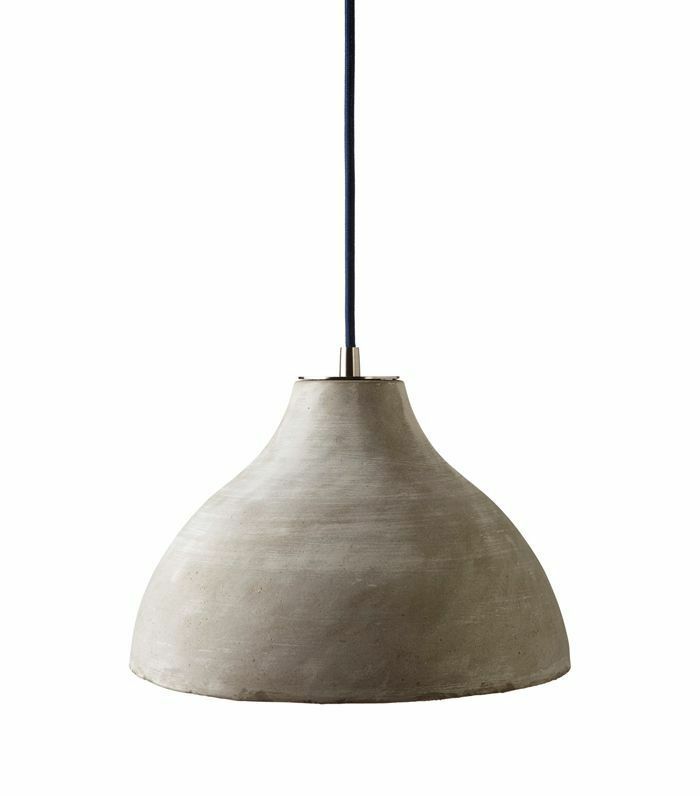 This tiered metal shade pendant is a gorgeous piece for a dining room with metallic features and hardware. We love the modern take on classic art deco design. 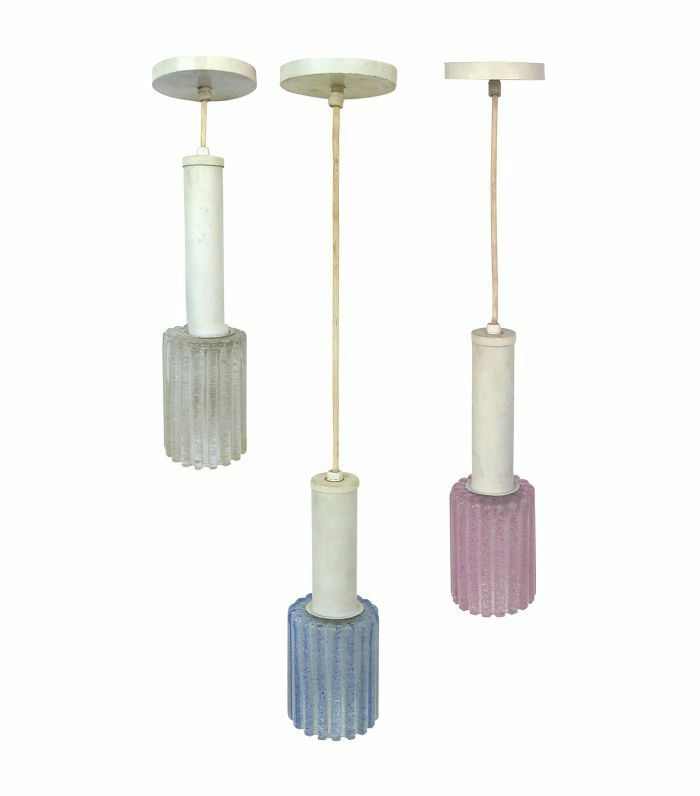 Lighten things up with this vintage collection of pastel pendants. We love that they're each a different length, and the combination of pink, blue, and clear glass creates a nice balance between consistency and juxtaposition. 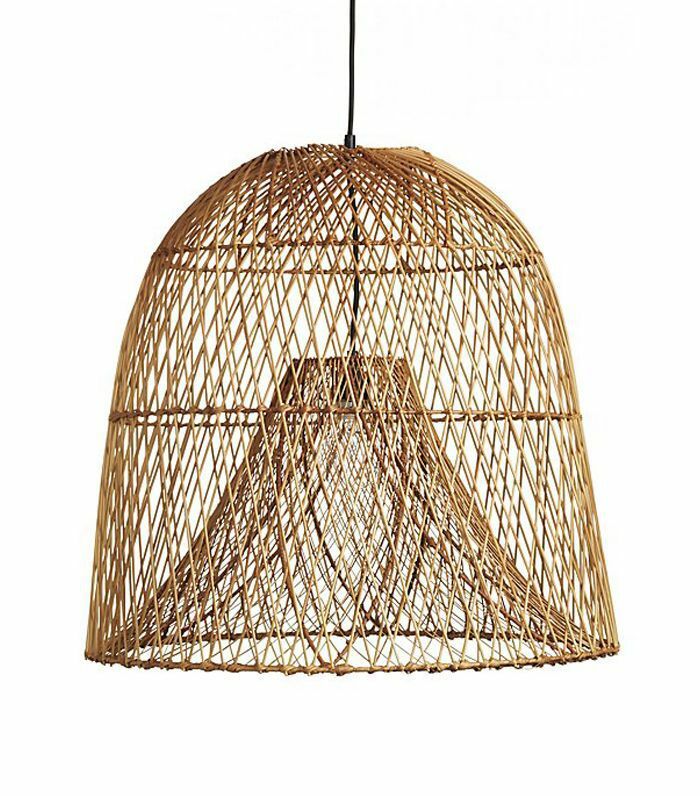 Inspired by vintage finishing baskets, the woven cane exudes an airy design that creates a beautiful, warm glow with a single bulb. Whether you're decorating a beach house or your simply want to summon the summer, this will do the trick. 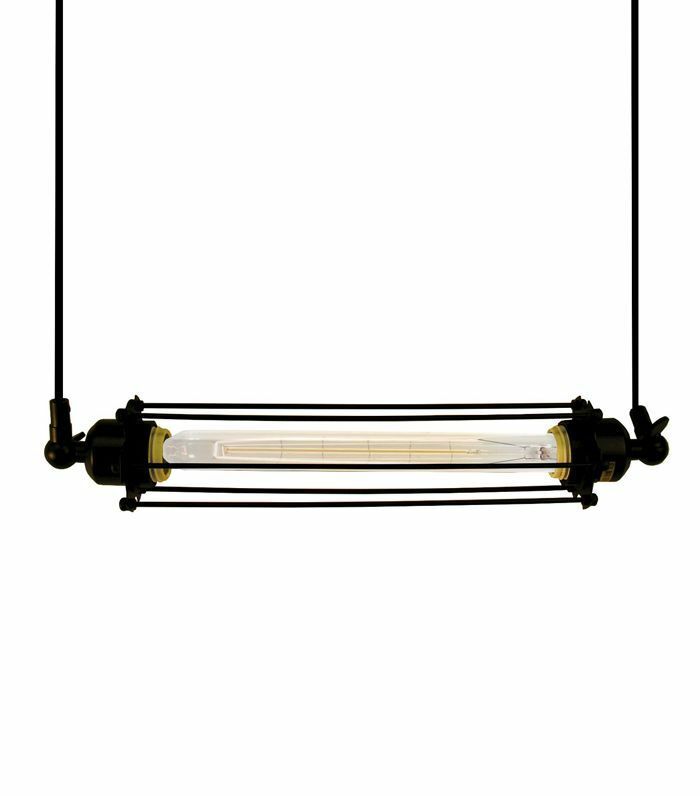 If you love the look of industrial design, opt for this linear pendant light. Aside from the edgy, raw style, the long shape makes it ideal for a kitchen island. 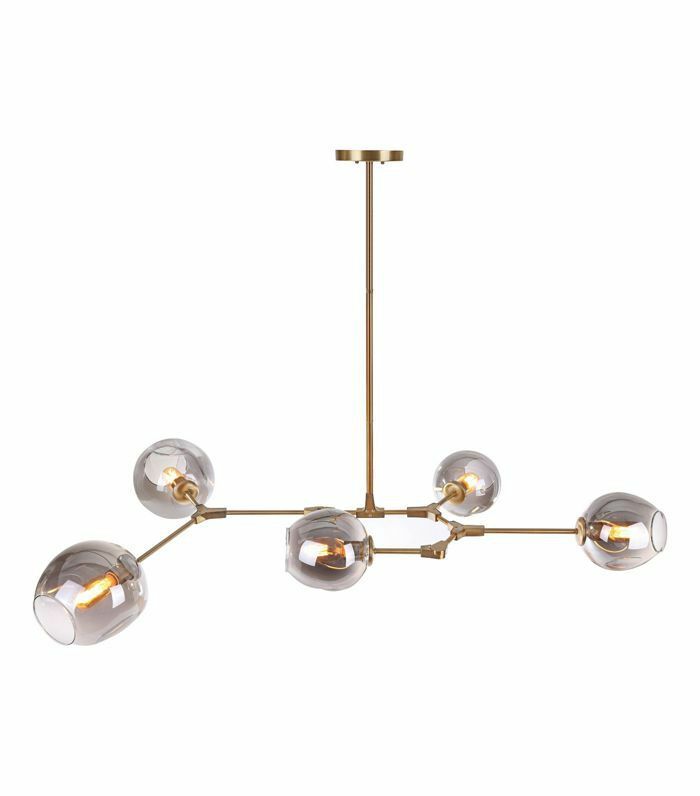 And now that we've handled the kitchen, get inspired by some gorgeous dining room lighting fixtures.